Party Supplies - GOT POWER? 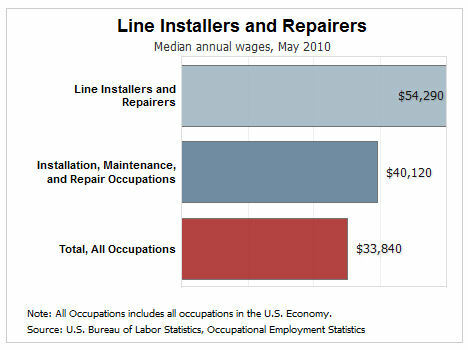 The median annual wage of electrical power-line installers and repairers was $58,030 in May 2010. The median wage is the wage at which half the workers in an occupation earned more than that amount and half earned less. The lowest 10 percent earned less than $33,680, and the top 10 percent earned more than $82,450. The median annual wage of telecommunications line installers and repairers was $50,850 in May 2010. The lowest 10 percent earned less than $26,910, and the top 10 percent earned more than $73,320. Many line installers and repairers belong to unions, principally the Communications Workers of America, the International Brotherhood of Electrical Workers, and the Utility Workers Union of America. For these workers, union contracts set wage rates, wage increases, and the time needed to advance from one job level to the next. Line installers and repairers install or repair electrical power systems and telecommunications cables, including fiber optics. Every time you turn on your lights, call someone on the phone, watch cable television, or access the Internet, you are connecting to complex networks of physical power lines and cables that provide you with electricity and connect you with the outside world. Line installers and repairers, also known as line workers or linemen, are the people who install and maintain these networks. Electrical power-line installers and repairers install and maintain the power grid—the network of power lines that moves electricity from generating plants to customers. They routinely work with high-voltage electricity, which requires extreme caution. This can range from hundreds of thousands of volts for the long-distance transmission lines that make up the power grid to less than 10,000 volts for distribution lines that supply electricity to homes and businesses. Line workers who maintain the interstate power grid work in crews that travel to work locations throughout a large region to take care of transmission lines and towers. Workers employed by local utilities work mainly with lower voltage distribution lines, maintaining equipment such as transformers, voltage regulators, and switches. They may also work on traffic lights and street lights. Telecommunications line installers and repairers install and maintain the lines and cables used by local and long-distance telephone services, cable television, the Internet, and other communications networks. These services use different types of cables, including fiber-optic cables. Unlike metallic cables that carry electricity, fiber-optic cables are made of glass or plastic and transmit signals using light. Working with fiber optics requires special skills, such as the ability to splice and finish off optical cables. Additionally, workers test and troubleshoot cables and networking equipment. Line installers install new cable. They may work for construction contractors, utilities, or telecommunications companies. They generally start a new job by digging underground trenches or putting up utility poles and towers to carry the wires and cables. They use a variety of construction equipment, including digger derricks, which are trucks equipped with augers and cranes used to dig holes in the ground and set poles in place. Line installers also use trenchers, cable plows, and directional bore machines, which are used to cut openings in the earth to lay underground cables. Once the poles, towers, tunnels, or trenches are ready, line installers string cable along poles and towers or through tunnels and trenches. Line repairers are employed by utilities and telecommunications companies that maintain existing power and telecommunications lines. Maintenance needs may be identified in a variety of ways, including remote monitoring equipment, inspections by airplane or helicopter, and customer reports of service outages. Line repairers often must replace aging or outdated equipment, so many of these workers have installation duties in addition to their repair duties. When a problem is reported, line repairers must identify the cause and fix it. This usually involves testing equipment and replacing it as necessary. To work on poles, line installers usually use bucket trucks to raise themselves to the top of the structure, although all line workers must be adept at climbing poles and towers when necessary. Workers use special safety equipment to keep them from falling when climbing utility poles and towers. Storms and other natural disasters can cause extensive damage to networks of power lines. When a connection goes out, line repairers must work quickly to restore service to customers. Good health, education, and vacation benefits are common in the occupation. To become proficient, most line installers and repairers require long-term on-the-job training and some technical instruction. Formal apprenticeships are common. Most companies require line installers and repairers to have a high school diploma or equivalent. Employers look for people with basic knowledge of algebra and trigonometry and good reading skills. Technical knowledge of electricity or electronics obtained through military service, vocational programs, or community colleges is helpful. Many community colleges offer programs in telecommunications, electronics, or electricity. Some programs work with local companies to offer 1-year certificates that emphasize hands-on field work. More advanced 2-year associate’s degree programs provide students with a broad knowledge of the technology used in telecommunications and electrical utilities. These programs offer courses in electricity, electronics, fiber optics, and microwave transmission. Line installers and repairers get most of their training on the job. Electrical line installers and repairers often must complete formal apprenticeships or other employer training programs. These programs, which can last up to 5 years, combine on-the-job training with technical instruction and are sometimes administered jointly by the employer and the union representing the workers. Safety regulations define the training and educational requirements for apprentice electrical line installers, but licensure is not required. Line installers and repairers working for telephone and cable television companies receive several years of on-the-job training. They also may attend training or get technical instruction from equipment manufacturers, schools, unions, or industry training organizations. Although it is not mandatory, certification for line installers and repairers is available from several associations. For example, the National Joint Apprenticeship and Training Committee offers certification for line installers and repairers in several specialty areas. The Fiber Optic Association also offers certification programs specifically in fiber optics: the FOA Certification presents three levels of fiber optic certification for telecommunications line installers and repairers. Entry-level line workers generally begin with classroom training and an apprenticeship. Their on-the-job training begins with basic tasks, such as ground work and tree trimming. As they learn additional skills from more experienced workers, they may advance to stringing cable and doing service installations. In time, they advance to more sophisticated maintenance and repair positions in which they are responsible for increasingly large portions of the network. After 3 to 5 years of working, qualified line workers reach the journey level. A journey-level line worker is no longer considered an apprentice and can do most tasks without supervision. Journey-level line workers may also qualify for positions at other companies. Workers with many years of experience may become first-line supervisors or may become trainers. Color vision. Workers who handle electrical wires and cables must be able to distinguish colors because the wires and cables are often color coded. Mechanical skills. Line installers and repairers must have the knowledge and skills to repair or replace complex electrical and telecommunications lines and equipment. Physical strength. Line installers and repairers must be strong enough to lift heavy tools, cables, and equipment on a regular basis. Stamina. Line installers and repairers often must climb poles and work at great heights with heavy tools and equipment. Therefore, these workers must be able to be physically active for long periods without tiring. Teamwork. Because workers often rely on their fellow crew members for their safety, teamwork is critical. Technical skills. Line installers use sophisticated diagnostic equipment on circuit breakers, switches, and transformers. They must be familiar with electrical systems and the appropriate tools needed to fix and maintain them. Troubleshooting skills. Line installers and repairers must be able to diagnose problems in increasingly complex electrical systems and telecommunication lines. Workers who drive company vehicles usually need a commercial driver's license. Bureau of Labor Statistics, U.S. Department of Labor, Occupational Outlook Handbook , 2012-2013 Edition, Line Installers and Repairers , on the Internet at http://www.bls.gov/oco/ ocos195.htm .